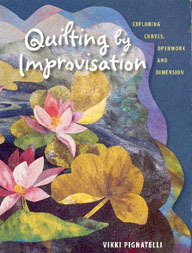 Quilting by Improvisation: Exploring Curves, Openwork and Dimention by Vikki Pignatelli. Published by Dragon Threads, 2006.…….. Vikki creates beautiful, bold landscapes using new techniques that capture your imagination. She passes along her keen understanding of colour and fabrics. Chapter 2 has the best instruction on colour I have read. Through the chapters she covers tools, fabrics and technique. There are lots of stunning photos and step-by-step guides. This book is a must have for anybody who wants to take their quilting to the next step and into the realm of art. Painting with thread……Embroidered pictures to make and cherish by Kit Nicol. This book was published in 2000 by Collins & Brown of Great Britain. Kit Nicol brings her paintings to life through paint and embroidery. Her tutorials begin with designing your own sketches using colours and paint. She covers materials required and different techniques using several kinds of thread and stitches including 3-D effects. The stitch tutorials are very clear with lots of photos and illustrations. The book includes 14 sketches from landscapes to human expression including the fountain on the front cover. Points of View is Valerie’s latest book. Valerie starts at the beginning with tips on what types of fabrics you will want to use in your landscapes, equipment that eases your journey through your personal masterpieces and how to get started. She includes lessons in creating basic landscapes, how to put together each piece as well as adding techniques throughout each chapter. You will learn how to colour your own fabrics using transfer dyes, fabric crayons, oil paint sticks and coloured pencils. The lessons are all well documented, photographed and easy to understand. I suggest you read through the whole book before trying a creation of your own….you won’t want to miss a step or technique that will make your landscape quilt shine.